Sew New: Contemporary Art Quilts features the work of 14 artists working in an assemblage of at least three layers fiber and/or mixed media formally and traditionally defined by the term “quilt”. The exhibition highlights the expansion of the boundaries of quilt making. If word quilt conjures up particular quaint and cozy images of homespun domestic craft, you will be surprised and delighted by this exhibition. These dynamic contemporary artists take a quilting tradition and amp it up it, using 21st century materials, a jolt of color, a conceptual twist- transforming it into an unexpectedly fresh and vibrant new medium. Quilting takes on a new dimension, literally, with the three-dimensional figurative work of California artist, Susan Else. 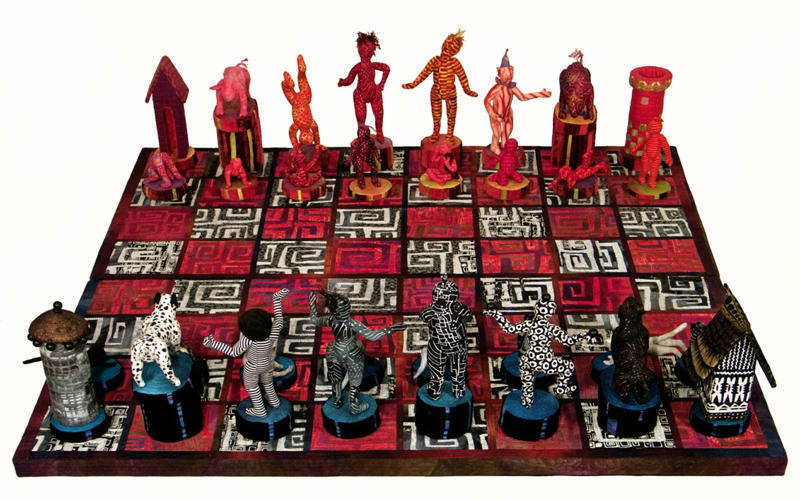 A three-dimensional chess set executed in fabric is just one of this artist’s whimsical creations. Some of the other non-traditional and techniques employed by these artists include Katazome (Japanese stencil) pioneered in this country by Karen Miller of Oregon, photography based screen printed fabrics by Marion Henrion and kaleidoscopic piecing work made famous by Paula Nadelstern, both from New York. The shrinking globe, the web of images and information available on the internet have all increased the availability of new raw and source materials and shaped the direction of these quilts – some are hand-dyed silks shaped into aerial views of landscapes (Linda Gass, California) or iridescent, transparent layers of organza (Jill Ault, Michigan), to name only a few. In contrast to quilters from the past who were largely self taught, many of these artists have degrees in fine art and/or art history. Textiles may not be the first or the only medium that these fine artists use. They are art-educated members of the contemporary art world. Quilts were first recognized as “art” and presented at a major art venue, The Whitney Museum of American Art in 1971 (Abstract Designs in American Quilts). The Gee Bend Quilt exhibition was first presented in 2002 and traveled extensively and highlighted the abstract and aesthetic qualities of abstract quilting. In the 30 plus years that separated these two major exhibitions quilt artists have been challenged to maintain the status of their quilts as “art”. There has been quiet and steady growth in shows of quilts in venues equal to those of exhibitions of sculptors or painters. In the past ten years the momentum has been extraordinary. The first Quilt National took place in 1979 as a grass roots effort Athens, Ohio. The 2011 Quilt National is the largest and most prestigious international quilt biennial. Curated by Kenise Barnes, owner and director of Kenise Barnes Fine Art (est. 1995) in Larchmont, New York. The gallery specializes in contemporary emerging and mid career investment quality art. With more that 25 years experience in the arts, Barnes is a frequent guest curator, speaker and adviser. Additional images from the exhibition available upon request. A genre-spanning concert weaves new takes on old classics, working songs, and songs celebrating life & change. Tickets: $20 adults, $10 children and seniors. Tickets available at door. The OSilas Gallery will open its doors for a special day of quilt appraisals! Led by Eugenia Barnes, certified by the American Quilt Society. Appraisal Inclusions: Report of Certification, Appraisal, Care and Maintenance Information Sheet, Record sheet for personal collections, personal works or family pieces. Eugenia Barnes is an appraiser certified by the American Quilt Society, and served on the Appraiser Certification Committeefor seven years. Ms. Barnes has traveled extensively as an appraiser, lecturer, judge and teacher of quilt and is listed in “Who’s Who in American Quilting,” 1st edition. Reservations required. Appraisals $35 each. A portion of all proceeds benefits the Gallery. Join us in the Gallery to explore the Exhibition, followed by a hands-on art project in the Art Studio inspired by the exhibit. Free! Children ages 5-10, accompanied by an adult.